This is a post I’ve been putting off writing for a while, as I find it a very tricky subject to cover without a hands-on practical. However, a question which has been asked of me a few times (and particularly following my last couple of posts) is how we know what type of fault caused an earthquake. Or, more specifically – how we know the earthquake which happened near Banda Aceh this week was strike-slip. It’s a subject a lot of geologists find a bit unintuitive, so here’s my attempt at clarifying the murky waters. Fault plane solution for the April 11th Banda Aceh M8.6 strike slip earthquake. In my original post I simply showed the focal plane solution (also known as the moment tensor solution, or fault plane solution, shown right), and left it at that. However, I thought it might be useful to provide a Fault Mechanics 101 that explains how and why fault plane solutions work, and how to read (and not read) them. For those of you already familiar with how seismic waves propagate, or how faults cause compressions and extension, you might want to skip straight down to the bit of moment tensors. The first important thing to understand (and most people are probably familiar with this from school) is that earthquakes generate a whole set of different types of seismic wave. There are two types of body wave (so called because the travel through the body of the earth) and two types of surface wave (so called because – you guessed it – they only propagate around the earth’s surface). While the surface waves are by far the most damaging in an earthquake zone, they are not of great use to seismologists, so today I’m going to ignore them. The body waves are more interesting; they are generated directly from the motion on a fault – as the rocks either side of the fault slip, that motion is transmitted to the bits of rock they are attached to – and so on and so on – throughout the body of the Earth. Because we live in a three dimensional world, these movements happen in three dimensions. Imagine I kick the table you’re sitting in front of. Imagine it as a mass of separate particles all attached to each other. As I kick the particle at the edge, it knocks into the next particle further in, which knocks into the next one along, and so on, until the particles your arm is resting on get effected and you feel the vibration. That’s a pressure wave, or P wave. Now, while this P wave was travelling through this row of particles, you have to remember that these particles have other ones that they’re attached to next to them. If you’re holding hands with someone and I shove you forward (please forgive me for my apparently violent analogies this morning), that motion will be transmitted to the person you’re holding hands with. Without moving towards that person, you’ve transmitted a motion. If they were holding hands with someone else, it would be passed to them too. But the line was never compressed. That’s called a shear wave, or S wave. There are a couple of awesome animations of P and S waves here. The final important thing to remember is that P waves always travel faster than S waves. Now, as you can see, there’s a number of features here we can identify. The most important one, however, (at least in terms of what we’re talking about here) is the ‘first motion’. That means as we read along the graph from left to right, whether the first seismic signal as the wave passes is positive or negative. The reason that’s important is that when a fault moves, while we get compression in one direction, it follows that we must stretch it in the other. Take an elastic band and stretch it between two fingers. Now grab the middle and move it towards one of those fingers. As you compress one side, the other stretches. These compressed and stretched regions are really obvious in the P wave animation I linked earlier. 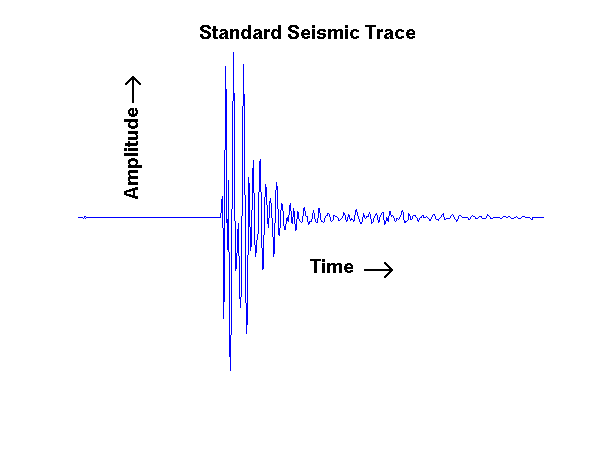 A compression motion will be marked as a positive first motion on the seismogram, while an extension motion will be marked as a negative first motion. Because each side of a fault move independantly, there is then a pattern developed in which parts around the fault experience positive or negative first motions. The image below shows a fault (running left to right), with sinistral movement (the top section has moved to the left). Around the fault are 6 seismic stations, and the traces you might find at each one. In the direction of first compression, you get a positive first motion, in the direction of first extension you get a negative first motion. 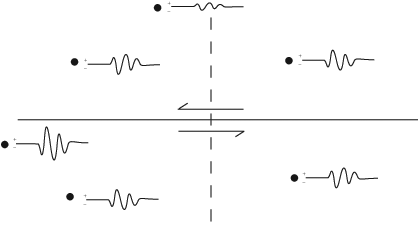 Hopefully you can see that the plot is divided into quadrants – the dotted line separating the positive first motion from the negative on each side of the fault. Now, rather than lots of little wiggles like that, we can make it easier by just shading the positive quadrants dark, and leaving the negative white. Even better than that, we can imagine this fault in 3 dimensions and plot those quadrants on a sphere. Although, actually, because earthquakes happen right up in the brittle crust, whena seismogram picks up a signal, the waves it detects are the ones that travelled down, through the crust and mantle, following the shortest path to other locations on Earth. So lets just draw the bottom hemisphere. Faults happen right up at the surface of the Earth. These first arriving P waves have travelled the shortest distance possible. Imagine you were standing on the North pole, facing the Greenwich Meridian (0 degrees Longitude) and I asked you to point at the South pole, you would point straight down. If I asked you to point at London, you would point straight ahead of you, and about 15 degrees below the horizon. To point at Melbourne, you would point 145 degrees East, and about 60 degrees below the horizon. And so on. So now, imagine there are seismograms at each of those locations, and you can mark on each one whether it was a positive or negative first motion. Once you have that data, you can separate the positive and negative datapoints using two planes which are 90 degrees perpendicular to each other. 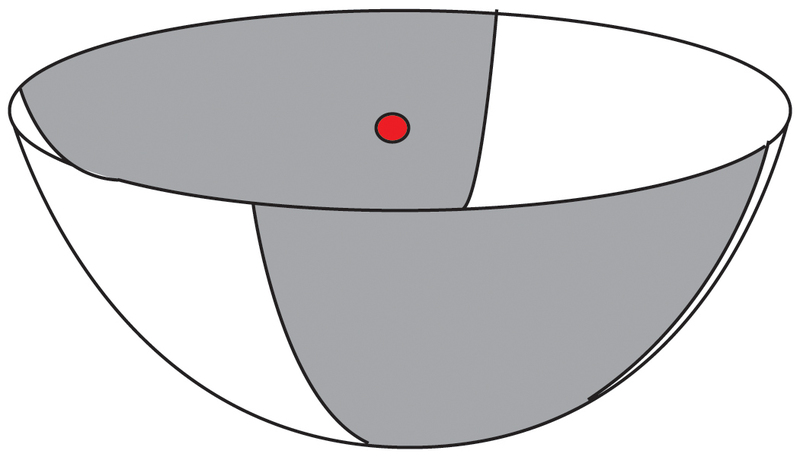 When you look at a fault plane solution, you are looking at one of these hemispheres, but rather than being projected into 3D, you are looking at it from the top down. Now, if a fault moves differently than the simple strike-slip shown above, obviously the directions in which the first push and pull propagate will be different. Let’s look at a normal fault (i.e., one which slips down the angle of the fault plane – an extensional fault). 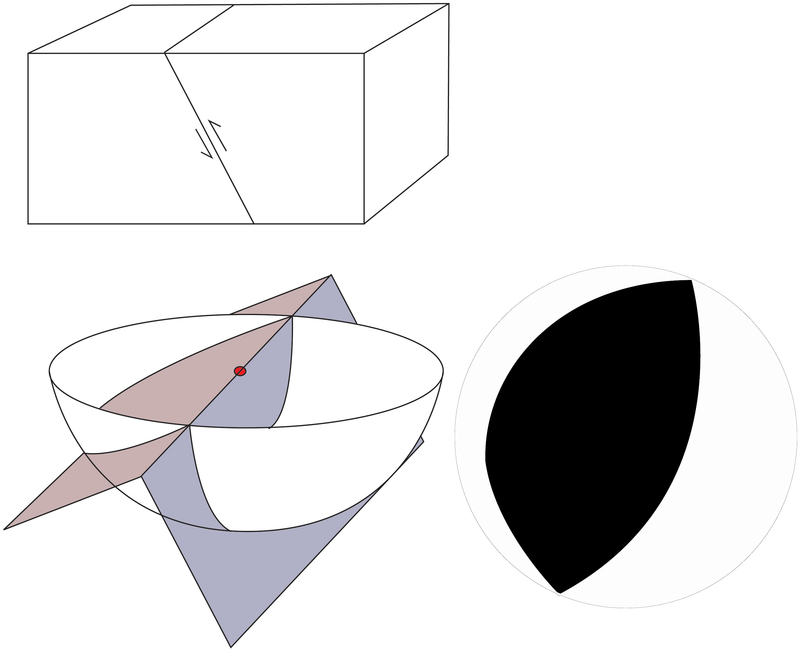 The image below shows a block diagram of the fault, a hemisphere (with both planes shown), and the top-down image of that hemisphere, simply shaded. The next image imagines the same fault, but this time experiencing thrust, or reverse faulting. As you can see, whenever we draw these, one of the planes that we are drawing correlates to the fault plane itself, the other one is simply a plane which is normal to it (i.e. 90 degrees away). The important thing to remember is that, without knowledge of the faulting area itself it can be impossible with only the seismic data to identify which is the fault plane. The other thing to pick out is that – as an amateur, you can very easily identify the type of fault which has occurred, simply by looking at the pattern of the fault plane solution. If it’s dark in the middle it’s a compressional (reverse) fault. Strike slip with some reverse component. Bombproof. Although it’s worth mentioning that the vast majority of fault motions are usually oblique, meaning they tend to have some component of strike-slip AND either reverse or normal faulting. The Banda Aceh fault movement, for example, is mostly strike slip, but with a slight compressional component to it, as shown by the slightly offset cross shape, dominated by the shaded (positive response) quadrant covering the center-spot of the fault plane solution. Remember, we can’t say just from the plot which of those two planes is the fault plane. It may either be NNE/SSW trending, or ESE/WNW trending. The only other odd case you might see, are solutions which have a single line visible. Either that plane is the fault plane (i.e. pure vertical dip), or the other plane is. That other plane must be perpendicular (i.e. lying horizontal). So the fault is either a vertical one with purely vertical motion (unusual), or a horizontal thrust fault (more common). So go have a poke around on the USGS site, and check out your new found ability to read the beachballs. Which reminds me. Calling them beachballs is a surefire way to get confused, and I’m pretty sure why so many people find these things unintuitive. 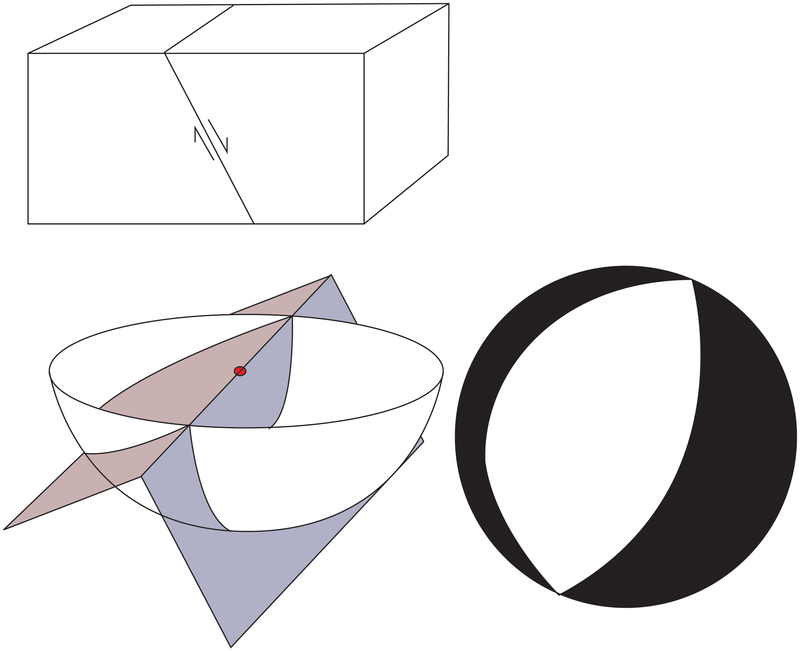 You have to always remember that these are projections of the bottom half of the hemisphere, and that you are looking down into a bowl when you look at these, not at a hemisphere popping up out at you. An anti-beachball if you will. This entry was posted in Earthquakes, Education, Geology, Geophysics, Physics, Science and tagged Banda Aceh, Earth, Earth Sciences, Earthquake, Fault (geology), Fault plane solution, focal plane solution, moment tensor solution, P-wave, S-wave, Seismic wave, Tutorial. Bookmark the permalink.